Worst Appearing Corn Field in World Here? What probably is the world's worst looking corn field also is one of the world's most important. The field consists of about 1.5 acres on the University of Illinois' agronomy south farm. The corn plants are all sizes, shapes, and colors. It would be surprising if the average yield turns out to be more than 10 bushels per acre. This sorry looking corn plot is the new Corn Genetics Research Center, the first of its scope in the world. It became established officially last Wednesday when funds for it became available from the U. S. Department of Agriculture Research and Marketing Fund and the U. of I. Graduate Research fund. However, the need for such a center has been stressed by plant breeders for many years. Cornell University at Ithaca, N. Y., had a center that partly met the need, but it was conducted on a smaller scale because of limited funds. Main purpose of the new center is the systematic maintenance of the genetic corn stocks adapted to the Corn Belt. However, the center also will develop new combinations of chromosomal testers, determine linkage relations of unplaced genes, and search for new genes. Center is supervised by Dr. Marcus M. Rhoades, professor of botany and professor of cytogenetics, recognized as one of the nation's top corn geneticists. Such a project has been needed urgently, according to Rhoades, be cause many genetic strains already have been lost forever to the corn industry. Without such a program, he states, many more strains will be lost. Carrying out the work of the center are Dr. J. R. Laughnan, of the botany department, and Dr. Earl Patterson, of the botany and agronomy departments. Dr. Patterson came here from the California Institute of Technology, where he worked on the effects of the Bikini atomic bomb explosions on plants, about two months ago to work for the new center. Cooperating with the U. of I in the center are the USDA, agricultural experiment stations throughout the North Central region, and the Primary Introduction Station at Ames, Iowa. The new center will save research workers from having, to maintain and develop genetic strains at many different places. "We're trying to get at the fundamental characteristics of the plants," he continues. "It's the genes carried by the chromosomes that govern the characteristics of the various plants." "Corn is one of the best material for studying genes," he points out "This work also will enable us to learn new facts about heredity in general." Several hundred genetic strains solicited from throughout the country now are growing on the center's plot at the U. of I. agronomy south farm. The variety in plants is startling. Some plants are dwarfs and never will reach knee high by the Fourth of July of any year. There are more than 20 different dwarfs. Some leaves are thin, some thick. Some leaves have yellow stripes,some white. Some leaves are smooth, some wrinkled. Some plants are dark green, some light green. Some plants contain more protein or oil than others. Some have the male sterility characteristic. Some leaves are waxed, some are not. Some plants mature early, some late. Some genetic strains don't even produce ears of corn. "You see, there are hundreds of genes and they affect everything," Dr. Patterson explains. "These plants are not monstrosities. They're genetic strains". "Some of these strains go back to the first part of the century. Many of them occurred spontaneously in nature. Others were induced experimentally." These plants, after being tediously hand - pollinated, will be harvested in the fall. The seeds will be made available to research workers not only in the Corn Belt but throughout the world, Dr. Patterson states. Stocks of the genetic strains will be stored both here and at Ames where there are cold storage facilities. However, distribution will be handled through the center at the U. of I. "We're expecting more than 100 orders for genetic strains this fall," Dr. Patterson says. "We already have requests from several foreign countries." Next year and in other future years more and more genetic strains will be maintained and made available through the Corn Genetics Research Center at the U. of I. More new combinations of chromosomal testers will be developed. And more genes will be discovered. All this probably will make the center's corn plot larger and even more worthy of the title of the world's worst looking corn field. But the center will increase in value to research workers throughout the world and the results will be hybrids that produce more and better corn for the farmer. 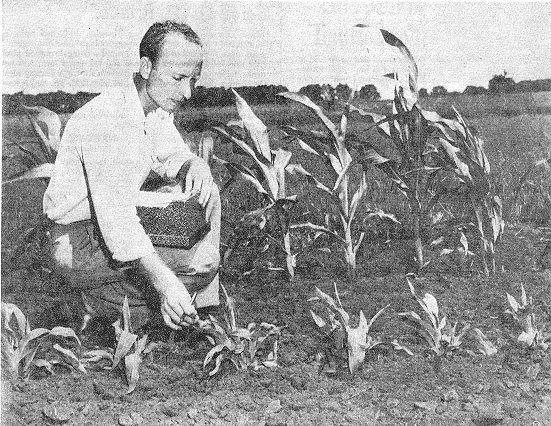 PHOTO: Dr. Earl Patterson, of the botany and agronomy departments at the University of Illinois, checks the progress of some genetic strains of corn growing on a plot at the U. of I. agronomy south farm. Plot is the new Corn Genetics Research Center, which will maintain and make available corn genetic stocks to research workers throughout the world. In the foreground is a variety of dwarf corn. In the background is corn of more normal height, but also having its own genetic peculiarity.